Granite and Quartz are an ideal work surfaces for your kitchen – tough, durable and easy to maintain. Quartz is a man-made stone which has been specifically engineered for use in a busy kitchen, however care and precaution needs to be taken in order to maintain the beauty of your stone. We have put together a guide to help you care for and maintain your new Granite and Quartz worktops. Granite is a natural material and as such is porous. The surface of the stone can be penetrated by certain liquids and therefore will require sealing upon installation. This sealant aims to reduce the overall porosity of your granite. We would then recommend a re-seal of your granite worktops every 12-18 months thereafter (depending on use). This is a simple process and can be performed as a DIY task. Please speak with our team for more information on products and best practice. The granite slab is polished on calibrated industrial machinery before arriving to your chosen fabricator. Attempting to replicate this level of polishing to the face of the stone by hand is almost impossible. This means deep scratches and scorch marks from hot pans cannot always be repaired. The use of trivets and chopping boards for hot pans and cutting is always recommended, Stone Culture can provide matching granite and quartz chopping boards so please ask a member of our team for more information. Cleaning of your granite is actually very simple, all you need is a soft cloth (dish cloth or a sponge will do), a small amount of soapy water (washing liquid and water mixture) and strong tissues or a hand towel for drying. 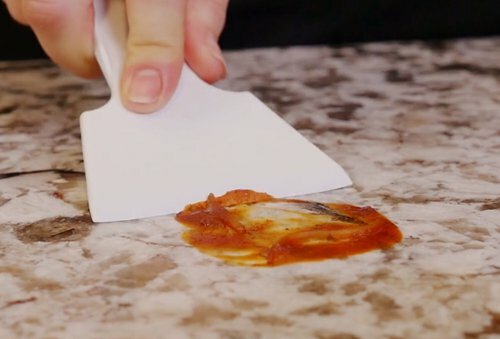 We would recommend a daily clean (after food preparation) to wipe away any food crumbs and stains from the surface and dry off immediately after. Spillages from household food items such as vinegar, tea, coffee, wine, vinegar, fruit juice, and oils need to be wiped away immediately. Avoid using harsh abrasives and sponges and stay away from window cleaners and acid-based cleaners, like vinegar, lemon, lime, or anything with ammonia or bleach. Using a micro fibre/synthetic chamois for drying will help avoid streaks and bring out a fabulous shine. Drainer grooves can be cleaned using 000 grade, non oiled wire wool but always avoid the use of abrasive cleaners or scour pads. If you feel your granite worktops needs a deeper clean a 50/50 mixture of isopropyl alcohol and water can be used. Again, wash down with clean water and dry off immediately. Some items harden as they dry and become more difficult to remove. Firstly remove any excess with a blunt plastic scraper, then clean the surface with a damp cloth and if necessary a small amount of non-bleach, non-abrasive household cream cleaner. Rinse thoroughly and dry with paper or cloth towels. Do not expose your granite worktops to excessive heat. Although Granite is somewhat more heat resistant when compared to Quartz, avoid placing hot pans directly on to the surface of the stone. Always use trivets and chopping boards. The stone is treated before leaving the factory to help resist staining. Be mindful therefore of acidic and spirit based products such as wine, fruits, nail polish and perfume. Care should also be taken with oil based products such as olive and cooking oils as these may stain if allowed to soak into the worktop. Should spillage occur, wipe off as soon as possible. Oils and dyes capable of staining can be found in common food items such as curries and popular take-away options. Therefore, please do not allow spillages from these types of products to remain on work surfaces for any prolonged amount of time. Worktops should not be brought into contact with strong acids or chemicals including paint stripper, brush cleaner, oven cleaner, nail varnish remover, degreasant or similar products. Do not move your worktop from the original place of installation. Cutting directly on the stone worktops may scratch the surface. To be safe use a separate chopping board. Quartz worktops are a man made material, consisting typically of 90% natural quartzite and 10% of resin and other materials to help give it strength, colour and consistency. Quartz worktops are actually fully sealed and therefore will never require any re-sealing. General food preparation can be done with peace of mind as the quartz worktop is almost impenetrable, which means bacteria will not harbour beneath the surface or between the veins and fissures of the stone. However great care still needs to be taken in order to protect the polished surface/face of the stone. As with granite, the face of the quartz stone slab is polished on calibrated industrial machinery before arriving to your chosen fabricator. Attempting to replicate this level of polishing to the face of the stone by hand is almost impossible. This means deep scratches and scorch marks from hot pans cannot always be repaired. Cleaning of your quartz stone is actually very simple, all you need is a soft cloth (dish cloth or a sponge will do), a small amount of soapy water (regular washing liquid and water mixture) and strong tissues or a hand towel for drying. We would recommend a daily clean (after food preparation) to wipe away any food crumbs and stains from the surface and dry off immediately after. Spillages from household food items such as vinegar, tea, coffee, wine, vinegar, fruit juice, and oils need to be wiped away immediately. If you feel your quartz worktops needs a deeper clean a small amount of (non-bleach/non-abrasive) household cream cleaner can be used. Again, wash down with clean water and dry off immediately leaving no residue behind. Do not expose your quartz worktops to excessive heat. Avoid placing hot pans directly on to the surface of the stone as these can cause scorching. Always use trivets and chopping boards. Be mindful of acidic and spirit based products such as wine, fruits, nail polish and perfume. Care should also be taken with oil based products such as olive and cooking oils as these may stain if allowed to soak into the worktop. Should spillage occur, wipe off as soon as possible. Avoid leaving your quartz directly exposed to ultraviolet rays for any prolonged length of time as this can be responsible for fading the colour. The above information should help keep your new granite/quartz worktops in fabulous conditions for many years to come. However defects such as discolourations and imperfections can occur. Granite is a naturally sourced material, unfortunately there are very few (if any) manufacturers/suppliers/brands which will offer any type of warranty to cover imperfections and discolouration or your granite worktops. However, in the event that your quartz worktops begin to fade in colour or begin to show marks within the surface of the stone (imperfections) it is likely there will be a brand/manufacture who will offer a warranty which covers this. For more information on your specific product warranty please contact a member of our team. Generally speaking, the quartz brand/manufacturer will offer a material only warranty, this means they will only supply the required material to a fabricator of your choice in slab format. Therefore it is important for you to use a reputable fabricator who will help manage the labour costs in the case of a material warranty claim. Stone Culture offer a 12 labour only warranty which not only covers you for things like breakages around unsupported areas, seams/joints coming apart or silicone sealants shrinking, we also will cover labour costs including template, fabrication and installation in the case of a successful manufacturer material warranty claim within the first 12 months. We hope you have found this blog post helpful, please feel free to leave your comments and feedback below.